The reason for summoning the envoy is Ukraine’s "aggressive and provocative action"
MOSCOW, November 26. /TASS/. Ukraine’s charge d’affaires will be summoned to the Russian Foreign Ministry over Kiev’s provoked clash in the Kerch Strait, Russian Foreign Ministry Spokeswoman Maria Zakharova told the Rossiya-24 TV channel on Monday. "The reason,” the diplomat emphasized was “Ukraine’s aggressive and provocative action." Zakharova stressed, "This is not just non-compliance with legal norms, but also a thoroughly planned operation and aggressive steps." "As far as we understand, this provocation and a whole slew of provocative actions had been prepared in advance," she noted. On November 25, three Ukrainian warships illegally crossed Russia’s state border in the Black Sea and entered Russia’s territorial waters performing dangerous maneuvers. The ships did not respond to the demands of the Russian Federal Security Service border directorate and the Black Sea Fleet to stop and continued on their way. 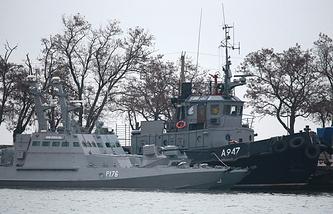 All three Ukrainian Navy vessels, which had violated the Russian state border, were detained in the Black Sea, following a pursuit involving gunfire, which forced them to stop. Three Ukrainian servicemen were slightly wounded and received medical assistance, the FSB said, adding that their lives were not in danger. A criminal charge has been filed over breaching Russia’s state border.